« Rise Up Alaska! Protect Our Daughters! 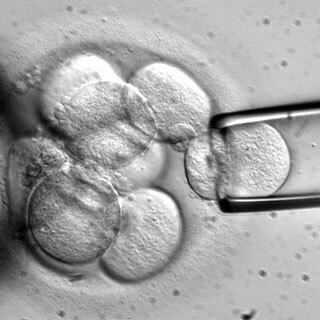 Human embryo having one cell suctioned off (R). Why, in the face of hundreds of extant therapeutic applications from Adult Stem Cells (ASC), would researchers wish to pursue embryo-destructive research when Embryonic Stem Cells (ESC) haven’t made it out of animal trials because of their tumor-forming propensities? As a Molecular Biologist, I am asked this question frequently by pro-lifers. Though I am adamantly opposed to embryo-destructive research, I’ll answer for them. The answer is simple: They just want to know. Period. End of story. A common misperception about scientists is that all of us are oriented toward therapeutic discoveries. Not so. Many scientists are indeed oriented toward therapeutic applications, a great many are not. They practice basic research. That is, research with the sole purpose of discovering how things work. These are the ‘pure’ scientists, not oriented toward a given or serviceable outcome. Knowledge simply for the sake of knowledge. Don’t knock it. It’s vital. Therapeutic advances grow out of the body of basic scientific research. In my graduate studies in molecular microbiology, I discovered quite by accident a whole new dimension of E. coli’s cellular physiology. It was genuinely exciting stuff for a new researcher, to unlock the secrets of nature through the rigorous and diligent application of the scientific method. It turns out that my discovery has all sorts of food safety and medical applications as well. Having presented the research at conferences, a few papers on it should get published this year. Even if my work had no practical application, it is extremely gratifying to be able to offer the scientific community another piece of the puzzle. I am a basic researcher at heart. In the lab I live for this stuff. So it’s not difficult to understand other molecular and developmental biologists who have the burning desire to know exactly how we are made in the womb. As a scientist who has studied developmental biology in grad school, I share that burning desire to know the awesome complexity and intricacy of the developmental process. It’s fascinating material. As a Catholic Christian I’m not willing to kill babies in order to find out. Therein lies the dilemma. In the wiring-up of the nervous system, cells from the tail end of the spinal cord secrete chemicals that diffuse to the brain end of the spinal cord, inducing nerve cells to grow in that direction. Along the way the projection of the growing nerve cell, called the growth cone, is guided by molecules on the surface of other cells. This is precisely the developmental stage that will be needed to glean the information necessary in spinal cord injury repair therapeutics. What will we do when we have deduced the answers at the simpler level of development, but now require an organism with a developing nervous system, the point where spinal cord injury repair can be tested? Having proceeded so far down this path, what rationale will be called upon for scientists to stop so much closer to potential therapies? The scientific community won’t hear of it. And really, at that point why should they? The principle that all human life is sacred will have long-since been compromised into obscurity. All we’ll be left with is an argument over the details. Dogs fighting over the carcasses of our own young. I want to know these answers as much as the fiercest proponent of ESC research. I’m just not willing to sell out the innocent for my answers. If I don’t get them here, I’ll have eternity to get them from The Source. In this battle over ESC and ASC, we do well to lobby lawmakers on where the entire source of therapeutic benefits resides, namely ASC’s. It’s even more important to educate the public in this regard. We also need to understand the lobby of university researchers who have a very different motive for this research. Money is also a major issue. When funding is set aside for a given line of inquiry, cash-strapped departments line up like refugees at an oasis in the desert. Promises of potential therapeutic applications are added to research funding proposals to gussy them up. For the college, it’s the money. For the basic researcher it’s the money, the knowledge, and publications. For the applied researcher it’s the cure. For the politician, it’s cynically using the scientific community to lay down a noble-looking smokescreen in order to protect abortion by treating embryos as fungible laboratory substrate. In truth, America is just beginning a love affair with the fetus through advanced imaging systems. Had we a love affair with the fetus, abortion would be illegal, and there would be no debate over embryo-destructive research. It seems that pro-choice politicians have seized upon embryo-destructive research as the means to realize Elder’s fondest desire. Can you explain, without reference to any canon of your church, why and how a newly fertilized zygote is a human being? Obviously, I don’t agree, or I wouldn’t ask. I understand that there is, inevitably, a slippery slope here. At one end of pregnancy, we have a single cell, containing a complete blueprint for a human being. At the other end, we have a baby. Defining a line in between, where on one side we have a non-person, and on the other hand we have a person, is fuzzy at best. But that doesn’t mean we shouldn’t try. Despite the logic of saying “Well, she should have kept her legs crossed if she didn’t want a baby,” it seems to me that coercive laws regarding abortion are clinically irresponsible. The woman concerned has to carry the pregnancy to term; no man or woman can volunteer to do that for her. Then, although there are some appropriate safety valves, including laws for anonymous abandonment at safe havens such as hospitals, the woman has to spend eighteen years legally responsible for the resulting child. However, once a baby is delivered, pro-life individuals are free to accept responsibility to raise the baby. Roe v. Wade recognizes that in the later stages of pregnancy, there is a sufficiently well-formed baby to merit protection by society, and the state. I find the debate about “partial birth abortion” hypocritical, for the simple reason that third-trimester abortions are already illegal, unless the mother’s life or health is at stake. Intact dilation and removal is performed only during the third trimester. IF there is abuse of the “life or health of the mother” standard, and there is good cause to suggest such abuse, then address the abuse, not the procedure. The ultimate clinical use of stem cell research is the ability to scrape skin cells from my arm, and induce them to grow into a new pancreas which matched my immune system, in case I have cancer on my existing pancreas — or a new heart if my old one is diseased. In the Essential Books panel of the side bar, I link to Embryo: A Defense of Human Life by Robert P. George of Princeton and Christopher Tollefsen of University of South Carolina. Their book examines the issue by specifically avoiding religion, and comes to the same conclusions. I can’t recapitulate all of the arguments in a reply, but may do a weekly ‘book club’ series on it if people are interested. All of your answers are there. since it is a basic fact that humans beget humans, we know that when a man and a woman conceive, they conceive a human being (the law of biogenesis). that is to say, that the mother provides the nourishment and the environment for the newly formed human being to develop but the zygote orders it’s development. Mary Catherine gave some good reasons to believe that, biologically, the embryo is a member of the human species and that biologically, we were all once an embryo i.e. we are the same biological entity as the embryo that once grew in our mother’s womb. The same, however, can not be said of the sperm or oocyte that joined together to form the zygote. Let me say a few more words. The next question is “what makes a human being valuable?” Why can’t we kill each other? Is it because of something we do, something we have, something we know, a certain stage of development, etc? I think you’ll find that any sort of theory of “personhood” fails any type of serious scrutiny. Take, for example, viability. How does the ability to survive on the planet earth infuse dignity and moral worth on the human being? Again, where does that dignity and moral worth which gives us the right to life come from? I think the only satisfying answer is that human beings has inherent dignity and moral worth simply in light of the fact that they are human. This, of course then, includes the zygote, embryo, fetus, newborn, toddler, adolescent, teenager, and adult stages of human development. This is an extremely rough and sloppy sketch of the secular philosophy known as human exceptionalism, but I”d be happy to address any questions you may have. The article misses one of the other, or perhaps main, reason people insist on embryonic research- its link to upholding the culture of death and especially abortion. If you admit, and especially if you then put it into law, that the embryo should not be killed and used for research because it is a human being, then this shakes the foundation for abortion. Human Embryology & Teratology. 2nd edition. 1996, pp. 8, 29. Essentials of Human Embryology 1998 1-17. The Developing Human: Clinically Oriented Embryology, 6th ed. 1998, pg. 2-18. Human Embryology & Teratology 1996 pg. 5-55. “For the politician, it’s cynically using the scientific community to lay down a noble-looking smokescreen in order to protect abortion by treating embryos as fungible laboratory substrate. Please continue to comment here! Sweet, excellent Chris! I’m stealing those quotes! Here’s one more for the arsenal. Developmental Biology by Scott Gilbert is arguably the leading text in the field. Gilbert is on faculty at Swarthmore College. It is certainly true that fertilization is an important landmark, but a zygote does not possess nerves, consciousness, and since the soul is not known to be chemical in nature, it may not yet have a soul. I have sometimes imagined a soul, waiting in some other plane none of us can truly conceptualize, noting that the body to which it is scheduled for attachment has been ravaged by rubella, and will have no functional eyes, will be missing a limb, will have limited brain capacity. I hear this soul crying, “please, abort that ravaged body, take a little longer and make a fresh new body for me to inhabit!” Purely speculative of course, but I can think of nothing in the Bible which flatly rules it out. Like most things metaphysical, I’m sure it is all far more complex than we can invision. I think of a zygote as something like a self-expanding software file, which can grow into a human being. The zip file can’t operate as software. For the same reason, I am impressed with accounts of abortions being performed on fetuses which can be observed on the sonogram, trying to evade the probe. Unlike the zygote, there is good evidence that is a being sufficiently self-conscious to be aware of and seek to avoid destruction. On that ground I would consider saying, too late, you can’t turn back now. You already have a baby. I will check out the George and Tollefson book. If I cannot read it and satisfy myself they are wrong, then I have no business continuing to argue for my current position. I believe that you are mistaken in relying on a nervous system and consciousness before conferring human identity and status to the human embryo. The organism is human, distinctly so, from the moment of fertilization. It is the nucleus of every cell, identical in its genetic content, that forms both the species and unique individual identity of the organism. The uniquely subtle differences in anatomic structure and biochemical functionality of each brain arise from and are sculpted by the functional genomics of the cell. Therefore, it is ultimately the genome, present and functional in the zygote, that is the central organizing reality of the organism. Further, the organism is identifiable in terms of what kind of thing it is. There is no extrinsic agency or event to “make” the embryo human. We do not start with human egg and human sperm and end up with an organismal entity that is no longer human in its identity, only to become human once again at some later point in development. The creation of such a window of non-, or unhuman identity is crafted by the pro-choice lobby for the sole purpose of killing the child. The quote I gave by Gilbert says it all. Again, what I think we have happening here is that you are implicitly stating that in order for a human being to be worthy of life (not be killed), they must possess nerves and/or be conscious. In other words, is it the existence of nerves in my body that makes it so that it would be wrong to kill me? What about the existence of nerves infuses inherent dignity and moral worth to a human being? Having nerves does not change what the being is. Same goes for consciousness. It is very difficult to define consciousness, and probably even more difficult to tell when someone is conscious. For example, I’m quite sure my 2 year old is conscious, but I”m not so sure about my 6 month old… or what about a baby who is born premature at 26 weeks. Very difficult to tell if such a child is conscious, and my intuition says that such a child is not conscious. So it would seem that prescribing consciousness for inherent dignity and moral worth leads to the non-personhood of born children. But the issue again is really how does consciousness make someone from a being who can be killed into a being who can not be killed? Why should one believe that consciousness is necessary to keep me from killing you? The problem here is that there will always be a point f view by which we all are simply a zip file and can not operate as software. I need the earth along with its oxygen and life-sustaining properties in order to survive, or else I am simply a zip file. I’m a zip file if I’m in the middle of the ocean or falling 3000 feet downwards. The point here is that none of these situations change WHAT I am- a human being. Similarly, the fact that from a certain POV a zygote is a zip file does not change WHAT it is- it only changes the CIRCUMSTANCES in which it is placed. Talk to you later, Siarlys. If a zygote is removed from the womb, it will never know it is being removed. It will never feel the removal. It is not aware of its own existence. This is in marked contrast to the eloquent observations of late-term abortions, where sonograms show the fetus actively evading a probe, exerting some initiative to try to preserve itself. I think that is a very important difference. There may be an argument at some stage that a fetus has only a reflex, as would a frog leg, not real consciousness, but that would have to pass some rigorous examination before I would accept it. The statements I’ve made about a zygote also apply to a blastocyst, and an embryo. They also apply to some early stages of a fetus. Lack of earth or air do not render a human any less conscious or completely formed. A human removed from essential nutrients, or plunged into the ocean, would not be incomplete, but would be dead in very short order. It is a qualitatively different condition, having nothing to do with the software needed to run the organism. Your computer can have perfectly good software, but if the power goes out, it stops working. The other distinction I believe is relevant to any legal standard, as distinct from what any church is free to teach as its sense of the appropriate moral standard, is whether the fetus can live on its own outside the mother’s womb. I mean, live without being hooked up to a heart-lung machine and all kinds of tubes — live naturally. If it can, then removing it from the womb is a delivery, not an abortion, except in the rare instances where destroying the baby (at that point it is definitely a baby) is necessary to actually save the life of the mother. Occasionally, that does happen. Otherwise, at that point, any adult could take the baby and raise it, if mommy doesn’t wish to. No other person can implant the fetus in their own abdomen and grow it to full babyhood. Why do you assume that conciousness is the attribute that makes a human being valuable as the subject of rights? What about someone who is asleep, or in a reversible coma? Clearly, one need not be immediately conscious in order to deserve full moral respect. A human embryo deserves full moral respect because it is an entity of precisely the same kind as you or me, albeit at a much earlier stage of his or her natural development. In fact, each of us was once an embryo, who then developed through the embryonic, fetal, infant, child, adolescent and adult stages. If you are going to propose that an embryonic human does not deserve full moral respect, you are really proposing that not all human beings deserve moral respect. That means that you are denying that human beings are valuable because of the kind of entity that they are, and you are instead proposing that the moral value of human beings is derived from some acquired characteristic, that some human beings have and others do not, and which may vary in degree from one human being to the next. You have tossed away entirely the notion of equality, and instead replaced it with some kind of horrible utilitarian hierarchy of rights. All of this you can conclude even before you have decided which acquired characteristic is actually the relevant one. Regarding your final comment about being able to survive outside the womb, why do you exclude technological interventions to ensure the baby’s survival? How do you decide which interventions are licit and which are not, without being completely arbitrary? The moral value of a human being is surely not diminished by his or her state of dependency. This book is indeed excellent, and I second Gerard’s recommendation.